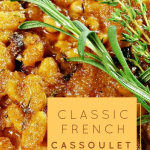 Classic French Cassoulet Recipe – In other words, a recipe for a classic French Cassoulet Maison. This recipe is not as complicated as it reads. 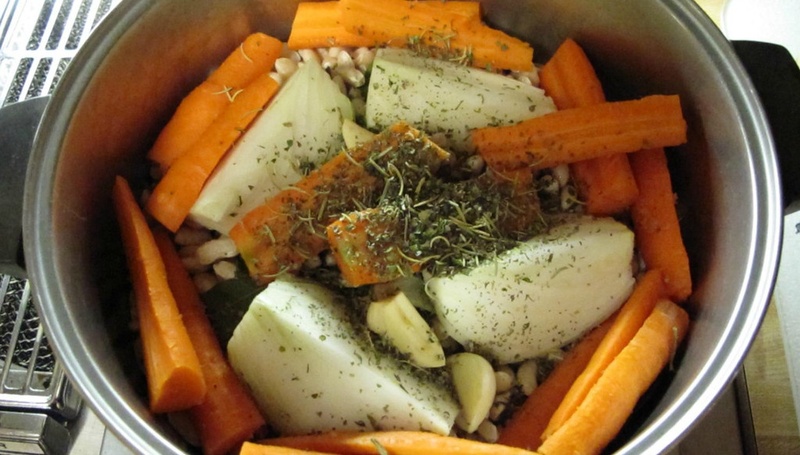 Even as a native and a newly minted cuisinière (aka “cook”), I hesitated to tackle what is, in effect, a stew recipe that takes two days to complete. In a hurry to prepare the recipe? Click HERE For Authentic Ingredients Or Buy It Ready Made! This recipe takes on the identity of the cook and literally has as many versions as there are cooks! It is such a popular dish that it even comes canned much like Hormel® Chili or Dinty Moore’s® Beef Stew. Back in the days when we lived “off the grid”, nothing was more welcome than a can of Cassoulet! McCall’s Cooking School Recipe Card: Main Dishes 3SO Good! 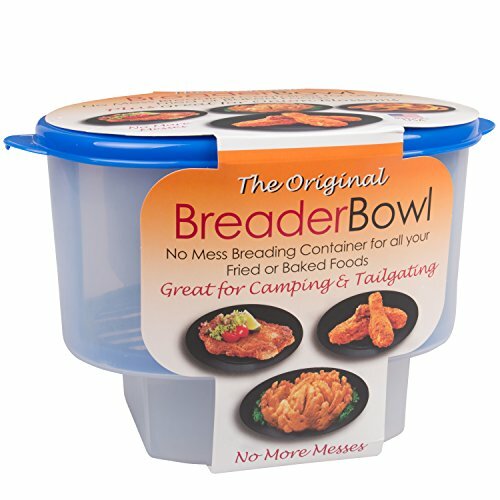 How much more home-style and comfort food can it be than a concoction of multiple roasted meats, sausage, beans and vegetables slow cooked to perfection and topped with a crust of perfectly seasoned bread crumbs? Do not be afraid to tackle a classic French Cassoulet recipe. You will quickly realize how you can make it your own by using different or fewer meats, different beans or none at all. How many one pot meals can you name that have earned their specialized cookware? Let’s cook up the ultimate comfort food. A classic French Cassoulet recipe is prepared with lamb, pork, sausage, duck and chicken. However, when you consider that beans are the basic ingredient, you can prepare the best Cassoulet with just one type of meat. Can you imagine an easy chicken dish made with boneless thighs or a version of this classic recipe using boneless pork country style ribs? As long as the seasonings and the cooking method is similar to the original preparation, you’ll be amazed at the tasty results and varied dishes you can create. Just between you and me, the family’s favorite meal is my slow cooker Cassoulet recipe! It’s just a matter of adapting the cooking process. I even adapted the recipe to the Instant Pot®. Mine is prepared “À La Mode De Chez Nous” in other words…home-style cooking at its best. It is the perfect menu item for chilly Fall and Winter weekends. In fact, we had it for dinner last night. Mini Garlic PressPerfect For Elephant Garlic Fresh Herb KeeperStore In Fridge! Herb & Spice GrinderPerfectly Ground! 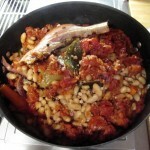 Cassoulet is a country style one pot meal which dates back to the Middle Ages. 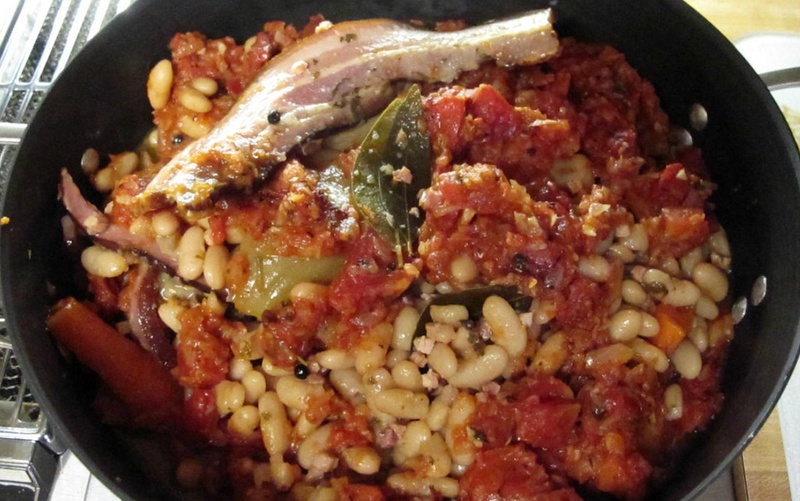 Even the famous chef Taillevant prepared this “stew of lamb, pork and beans”. 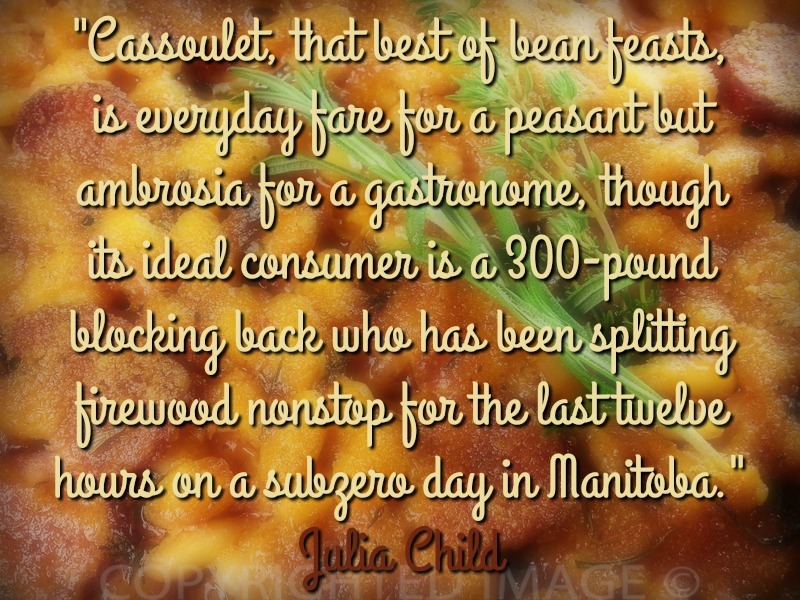 The first mention of Cassoulet in modern times dates back to the early 1500’s. It would seem that during a siege of their town by British troops, the inhabitants of Castelnaudary combined all the ingredients they had on hand – salt pork, sausages, beans and a variety of meats – to create a meal for their soldiers. Thus reinvigorated, the local troops beat back the British soldiers…all the way to the shores of the English Channel. 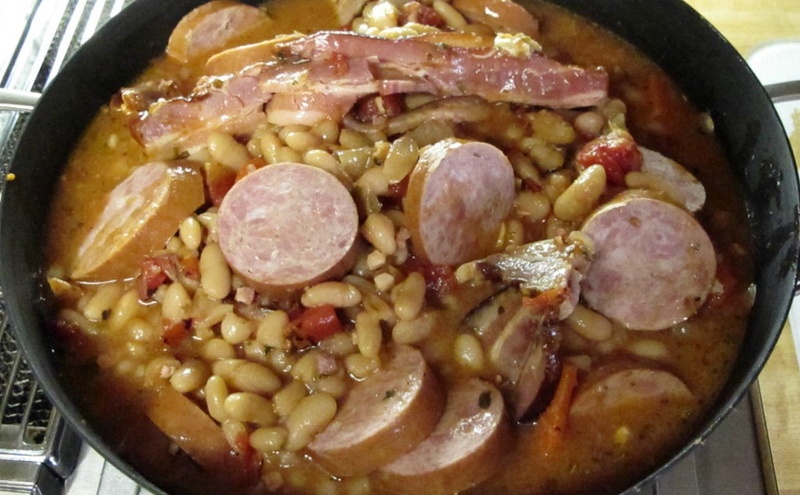 Cassoulet ranks as the ultimate regional dish – a bean stew which contains meat, usually Toulouse sausages (as seen in the photo), a cut of pork, duck magret and lamb, with fresh ventrèche and white lingots beans. Toulouse sausage [saucisse de Toulouse] is made of coarsely chopped pork flavored with wine, lots of garlic and seasonings. My best French cassoulet recipe does not have such lofty historical beginnings but it does rank as one of our favorite dishes during the winter. It is much too time consuming and expensive to make on a regular basis, even if it qualifies as the ultimate comfort food. Instead, it makes the cut as a special “company” dinner during the winter season -the perfect dish to prepare when you want a hearty meal and leftovers to boot! The recipe makes enough food for an army of hearty appetites, it is an expensive dish regardless of the variation you choose to prepare. I’ve found ways to cut the overall cost of the dish by substituting key ingredients. The resulting flavors do not venture too far from the authentic taste of the Castelnaudary specialty. 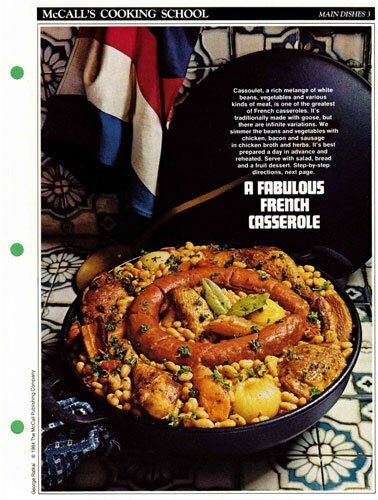 Certain cuts of meat are really a must to provide authentic flavors otherwise the Cassoulet becomes nothing more than a glorified version of franks and beans. It is not mystery meat…it’s duck magret. You can buy it at Wegmans® at Potomac Town Center, shrink-wrapped, and sold by Dartagnan Meats. It is also available in other stores such as Harris Teeter®, and even Giant®. Be careful not to confuse fresh duck (of the Long Island or Peking variety) with the smoked version of the magret. However, be aware that not all duck is magret! Nor is it confit! Magret is the breast of the duck (or the goose) that donated its liver to create foie gras. Duck is not a thrifty fowl but if you are going to splurge for this dish and buy duck (whole or in leg quarters), look for the name Moulard®. Be it whole duck, foie gras, magret or confit, it all falls squarely into the category of gourmet foods. What is the difference between fresh and smoked magret? The fresh magret can be pan seared skin side first and then on the meat side for a total of about 10 minutes. Smoked magret is fully-cooked. Just reheat and it is ready to eat. A less expensive way to duplicate the flavor produced by duck fat is to purchase Dartagnan duck fat and use chicken instead of duck. Brown all your meats in the duck fat to impart that distinctive “ducky” flavor. Toulouse Sausage for CassouletFresh Tastes Best! My recipe for cassoulet is often made with a boneless lamb shoulder, one large magret, several chicken thighs, sausage and about 6 country style, boneless pork ribs. The main meat ingredients vary depending on what is available when I shop. Last night’s dinner featured smoked turkey, pork shoulder, andouille (which is readily available in local supermarkets) and duck (I swiped a couple magrets which I had stashed to make a pâté de canard). See how versatile this bean stew can be? In any case, lamb or pork shoulder is considerably less expensive than an equal amount of duck. I also do not use authentic Toulouse sausages. The dish is just as tasty with similar, less expensive sausages – even andouille sausage from the Trois Petits Cochons® – found in your neighborhood supermarket. When it comes to andouille sausage, there is a world of difference in the flavor of traditional andouille versus Johnsonville’s® fully cooked andouille. For authentic flavor, use real andouille – fresh or smoked – it has a distinctive bite. The beans are covered with rich chicken stock and ready to place on a slow simmer for a full hour. Water is fine but the chicken broth just adds a layer of flavor. Complete your recipe on day two. The beans have time to absorb all the wonderful flavors over hours of slow cooking. Canned beans can only be reheated and never fully pick up the intense flavor of the variety of meats, vegetables, onions and herbs. A fresh baguette and a salad are the only other menu items required to make this one happy meal which actually tastes better on day three – if you have any leftover by then! Disregard the fact that many of the ingredients for this classic French cassoulet recipe are “Italian”. It is much easier to find these ingredients in Woodbridge, Virginia than it is to locate the traditional Tarbais beans, ventrèche, and other authentic ingredients required to prepare the dish. Sure, Dartagnan® sells “French” ventrèche pancetta but nobody will know the difference unless you tell them! This recipe for our home style Cassoulet is easy to prepare and a real one dish meal but it’s far from being the proverbial 30 minute meal. 8 ounces Citterio cubed Pancetta (2 packs). 3–4 cloves of fresh garlic. If you cannot find sausage seasoned with garlic, add a couple more cloves. In a large Dutch oven, cover the dried beans with fresh water. Bring to a boil. Reduce heat and cook on a very low boil for about 10 15 minutes. Drain the beans. 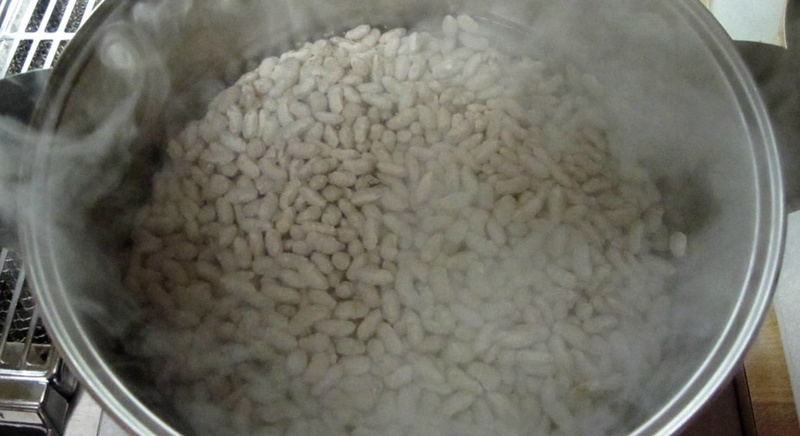 Dried beans are covered with fresh water and brought to a boil. Simmer 10-15 minutes. Place drained beans back into the Dutch oven, along with the pancetta, the pork rind, the carrots, 1 onion, 4 cloves of garlic and the bouquet garni. Drained beans are back in the dutch oven with onions, garlic, carrots, pepper and herbs. Cover the beans and other ingredients with fresh cold water. Place lid on Dutch oven and simmer for a full hour. After about 30 minutes, season the beans with salt and pepper. The beans should be just about cooked but not completely . The beans will finish cooking during the final step in the cooking process. In a separate pan, add duck fat and cook until golden but not burned: the remaining onions, the shallot and 2-3 cloves of garlic – all chopped finely. Add the peeled tomatoes, the tomato paste, salt and pepper to taste. Combine well with the onion mixture and simmer for a few minutes to blend flavors. Adjust salt and pepper to taste. 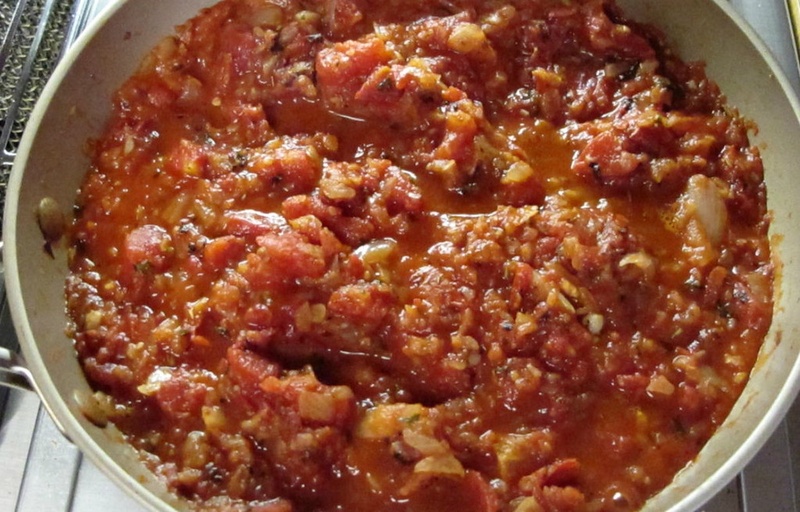 This tomato mixture is going to season the entire pot of beans! Add well combined onion/tomato mixture to the beans. With tomato mixture added to the beans, we’re almost done. Double check the seasonings. After this step, it becomes more difficult to season the entire dish. 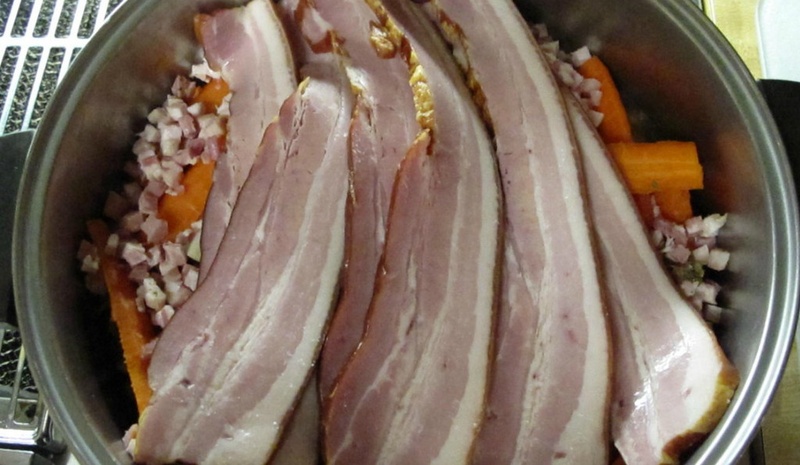 Don’t forget that the meats will impart their own smoky flavors. Gently pan fry the pork sausage in a separate dry pan. Once cooked, cut into 1 inch pieces and add to the beans. Add a few tablespoons of duck fat to the same frying pan and lightly brown the remaining pieces of meat. You can cut the boneless chicken thighs into 1 inch cubes before adding to the bean mixture. If you opt for the thigh/leg pieces, leave them whole. They will become a “portion” when serving. Oh..did I mention that this is a “Sausage” version? See how versatile this recipe can be? When you can’t find duck, use a variety of gourmet sausages – in this particular case…fresh kielbasa and smoked andouille. Step 8: Place dutch oven in a slow oven and bake at 325 degrees for a couple hours. Check often to make sure beans are not “dried out”. Add broth as necessary. When nearly done, sprinkle with bread crumbs and bake long enough to brown the crumb layer. A cassoulet is usually baked in a special earthenware crock called a cassole. Lacking the “real thing”, this recipe for cassoulet can also be baked in a large (at least 6 quart), oven proof, casserole dish, a cast iron dutch oven, or a Le Creuset stoneware 10-quart roasting dish. Shh…don’t tell anyone but I’ve even used my slow cooker for the final cooking step. Whatever works, right? To complete your recipe for cassoulet, in your casserole dish, layer the meats and the beans, finishing with a layer of beans. Add any reserved pan juices. If you are short on liquids, have a quart container of chicken broth handy. The beans may need more liquid to cook completely tender. Place in oven set at 325 degrees and bake for about 1 and half hours or until beans are fork tender. Combine chopped parsley and bread crumbs. Sprinkle over beans during last 30 minutes of cooking time. Bread crumbs should be golden but not burned. Note: The amount of dried beans to use depends entirely on how many people you plan on feeding and if you prefer more beans than meat. I use the equivalent of 1 1/2 lbs or close to 20 ounces of dried beans. This classic French Cassoulet recipe is ready to eat. Have any questions about my this recipe? Add a comment below and let’s compare notes and recipe ingredients. I shudder to think that Chef John calls this a recipe for fancy pork and beans but actually our “cassoulet maison” is glorified homestyle baked beans! None the less, you’ll be glad you put this classic French cassoulet recipe on your list of must try international dishes. Watch Jacques Prepare A Classic French Cassoulet Recipe In 30 Minutes! 3.2 Tarbais or Cannellini Beans? 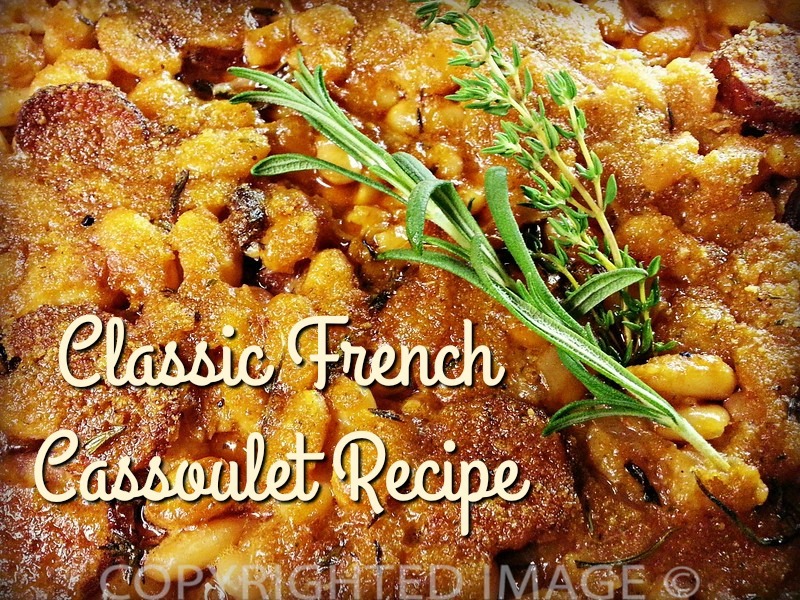 4.7 Watch Jacques Prepare A Classic French Cassoulet Recipe In 30 Minutes!